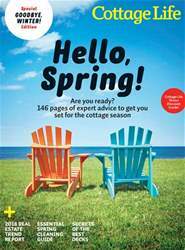 Digital Subscriptions > Cottage Life > SPRING 2018 > Trend alert: millennials are becoming cottage owners. Trend alert: millennials are becoming cottage owners. Want to buy an island, hahaha?” That’s what Shantel Clark recalls her father-inlaw saying when he texted her and her husband, Ian. Ian had grown up cottaging on an island about 30 minutes from Honey Harbour in Ontario’s Georgian Bay. Now, the family that owned the one-acre island next to them was selling. Even with a recent market softening, the average price of a detached house in Toronto is still more than $1 million, and in Vancouver, at almost $3 million, owning a house is beyond the reach of many millennials. “Home ownership has become unattainable in the Lower Mainland of B.C. for a number of years, even for people with very good incomes,” says Al Dubé, a financial advisor with Dubé Insurance and Wealth Advisory Services in Victoria. “But vacation properties can be much more affordable.” When you consider that the average price of recreational properties in Southern Ontario is $413,000, with waterfront properties on Saltspring and Vancouver Islands clocking in at around half a million dollars, the logic of entering the real estate market via the cottage market becomes clear. Easy Real Cedar DIY projects! Time to invest in a new cottage roof? Finally! Safe, longlasting bug removal! Discover Lake Huron’s West Coast jewel…beautiful Sauble Beach! Yes, a weedless waterfront can be yours! Three reasons why you should look for the Ontario Wood leaf! ARE YOU PREPARED FOR COTTAGE SEASON 2018?